Tip: If you pull the motor and trans out together as one unit, invest in a transmission tail plug to avoid trans fluid from pouring out the rear of the case during removal. Performance gains: hopefully you’re pulling the motor to either freshen up what you have, or to stuff a monster, fire-breathing big-block in its place! 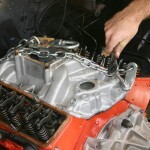 Pulling the motor out of a car is something every car builder or mechanic must do. It’s a rite of passage. It clearly shows that you are serious about the performance of your vehicle. For whatever the reason may be, the time has come to uproot the powerplant and seek alternatives. It can be intimidating at first for the novice, but if you take it slow and make a sound game plan, you will find there is nothing to it. In fact, it’s kind of fun! We chose two opposite intake manifold holes in which to chain and harness the motor. To perform the swap with ease, you will first and foremost need space. The engine hoist is not exactly petite and requires plenty of open floor room to move around. Secondly, it always helps to have an extra set of hands for the project. Although you can do it by yourself, it really is a two-man job, especially if it’s your first time. If you don’t currently own a hoist, they can be had for the day by any tool rental company or parts store for about forty bucks, depending on where you live. Most are collapsible and easy to transport in a pickup. This is not something you will use every day in the garage, so renting is really not a bad option. It also saves you the storage space at home. An engine stand, on the other hand is something you should definitely consider buying for yourself. Once the motor is out of the car, it needs to go somewhere! Whether for storage or rebuilding, engine stands serve as a perfect, mobile alternative to an old tire sitting on the floor. And they’re cheap! You buy a half-ton (or greater) engine stand for well under a hundred bucks and have it last forever. How can you go wrong? As you can imagine, there are quite a few preliminary steps to take before the motor is actually allowed to go anywhere. Right up there on the importance scale would be removing the hood. We, of course, thought we’d save some time and left the hood in place. Believe it or not, the engine still came out without too much drama. In hindsight, we’d recommend pulling the hood first though– imperative on a front-hinged hood like the Corvettes! Some people prefer pulling the transmission out with the motor regardless of the situation or the cause. They feel it’s easier to remove and to replace as one complete unit versus trying to align the motor to the frame and to the transmission bellhousing all at the same time. We would have to agree. The transmission serves a good centering point in the assembly, and helps balance the weight of the engine on the hoist. The engine is mounted to the frame with a rubber mount on both sides of the block. The only rear support it receives comes from the transmission mount at the rear crossmember. 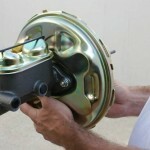 Therefore, that rear mount naturally centers the motor where it needs to be in relation to the frame. It always takes a little pushing and shoving to get things just right, but that’s normal. It really comes down to a matter of preference, or what you feel comfortable with. It can be done either way without too much hassle. In our particular case here, we had already removed the transmission for rebuild work. 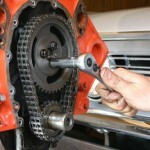 Using a boxed wrench and a socket, loosen and remove the two motor mount bolts. The first thing you need to do is disconnect the battery and completely drain the cooling system. Not only will this reduce the overall weight on the hoist, but will also make the removal process much cleaner without spills. You will need to remove the front engine accessories such as the alternator, power steering pump, water pump, and A/C unit, as well as their various brackets and pulleys. 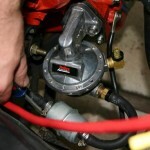 Detach the fuel line at the fuel pump and clamp it off. Keep track of and label the hardware for each component, better yet, take pictures. It may be a long time before it’s actually reassembled. Moving to the top of the engine, remove the carburetor and the air cleaner assembly and all attaching hoses and brackets. Disconnect the throttle linkage from the firewall and set it aside. Remove the distributor, ignition coil, and the plug wires. 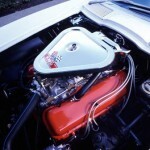 You want the motor to be as short as possible to allow for maximum lifting clearance under the hood. If you have a high-rise intake manifold, pull it off. 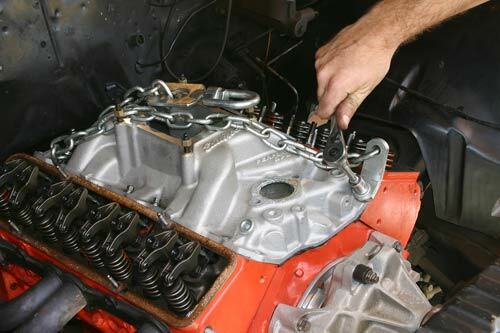 You can use the manifold holes in the cylinder heads to chain the motor and pull it out. Be sure to disconnect any wiring harness connectors, temp sensors, or oil pressure fittings from the manifold, cylinder heads, and engine block. On 4-speed cars, you will need to disengage the clutch linkage from the ball stud coming out of the engine block. Remove the springs, rods, and the Z-bar assembly. If you choose to remove the transmission along with the motor, unbolt the shifter and the shifter handle. The same applies for automatics. Any obstructing floor or column shift linkage should be removed. Engine compartment space will vary for each car. Some may require the removal of the radiator, spark plugs, exhaust manifolds, the starter assembly, and definitely headers. In fact, aftermarket headers can prove to be a real pain in this situation. You may need to disconnect them at the collector as well as the cylinder head, and allow them to move freely as you pull the engine up and out. This is where the extra set of hands come into play. For some vehicles and engines, hood removal may be required. If the transmission is staying in the car, unbolt the bellhousing from the back of the block and support the front of the transmission with a floor jack. On automatic equipped vehicles, you will need to remove the torque converter from the flexplate. Be sure to note their relation to each other before unbolting the converter. Automatic transmission cooler lines should also be disengaged. If you decide on the shoehorn method, unbolt the transmission from the mount at the crossmember. Use the floor jack to support the trans until it is lifted out. Disconnect the speedometer cable from the side of the transmission and pin it back out of the way. It may be necessary to loosen and remove the rear crossmember once the transmission is unbolted for added clearance. With all of that said, unbolt the motor mounts from their frame brackets and chain the motor. 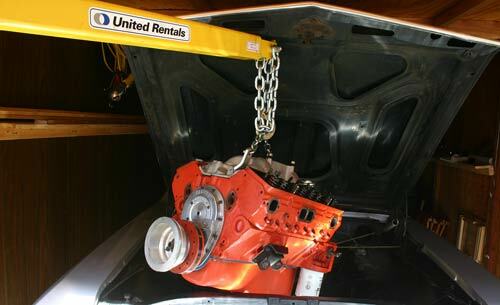 Be sure to use a heavy-duty chain and hardware for lifting the engine. Try to pick two symmetrical points on the motor to further aid in balancing the weight once it’s in the air. If necessary, use a floor jack to lift the motor up to meet the hoist in order to minimize any unwanted swag in the chain. Attach the hook of the hoist to the center of the chain and slowly bring it up. 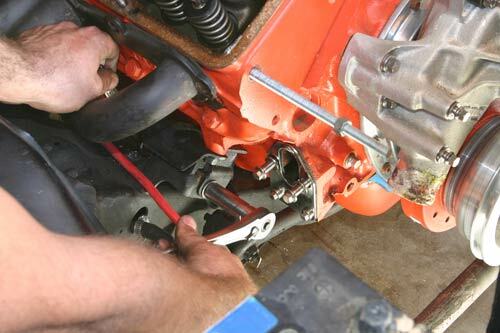 Have a friend watch and guide the rear of the motor and/or transmission as it comes up and out of the engine bay. The idea is to slowly lift the motor and roll the hoist back- allowing it to exit and swing out over the front of the fender. In hindsight, we’d recommend pulling the hood first though– imperative on a front-hinged hood like the Corvettes! Lower the assembly to a safe working area and remove the transmission and/or the remaining components. Attach the mounting brace of the engine stand to the back of the motor and slide the brace into the stand. You can now lower the hoist and remove the chain. Although it sounds like a lot of work, it’s really not that bad. One time and you’ve basically got it down. The installation is pretty much the same in reverse. Take your time, be careful, have fun, take pictures! I own a 1984 Corvette. The only thing stopping me from taking on the task of replacing my transmission was not owning an engine hoist. Thank you for informing me that they are so inexpensive to rent. Where exactly would one go to rent an engine hoist? Rental companies vary region by region, but a good national chain is United Rentals. They should be able to help you.